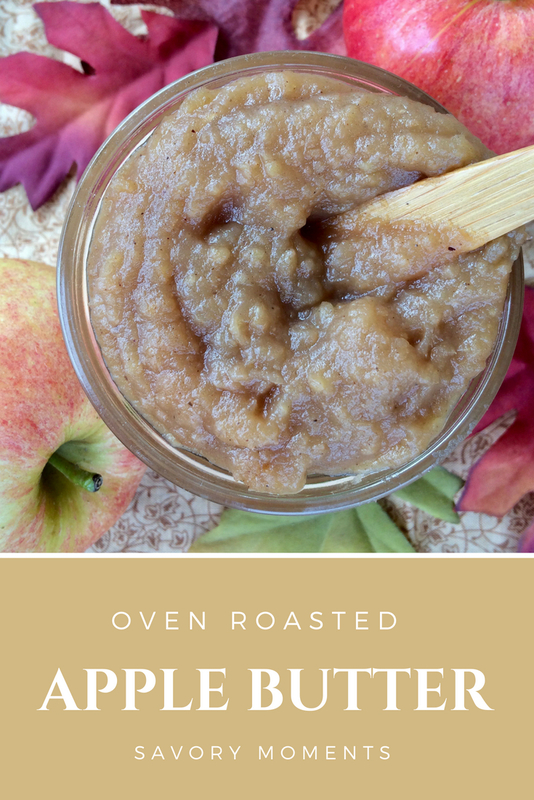 Apple butter is taken to another level when you slow roast it in the oven. The apple flavor condenses and you get a hint of a caramelized flavor for the most amazing and deeply apple-y apple butter! This is my first recipe for #AppleWeek! I'm so excited to join this event this year because as my readers know I have a bit of an apple obsession. Stay tuned all week for bushels of fabulous apple recipes! This apple butter was made in this Swiss Diamond XD Nonstick Roasting Pan. I am so excited to be able to add this roasting pan to my cookware collection. According to Swiss Diamond's website, their XD coating features not only a new nonstick diamond-reinforced coating formulation, but also an advanced PFOA-free and eco-friendly production process. 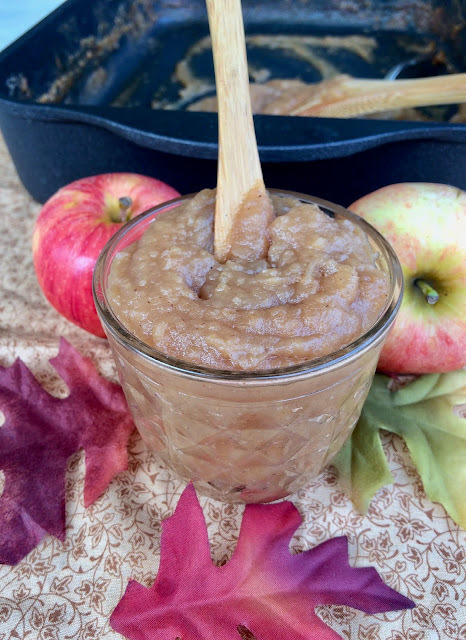 The apple butter in this recipe reduces down a lot of leaves apple residue on your pan, but clean-up was so simple - just soapy water and a sponge and it wiped right off. This roasting pan is going to be perfect for our family all year round for making roasts, chicken, and even casseroles. Don't forget to enter to win one of the awesome prizes from our sponsors! I lightly spiced this apple butter to really highlight the apple flavor and not overwhelm it with too much spice. I also did not add any sugar as I used sweet apples. If you use more tart apples, or want a sweeter product, feel free to add some brown sugar to the recipe after it is pureed. This recipe will make about 2-1/2 cups of finished apple butter. I left one small jar in my refrigerator and froze another two jars for later. Any sweet apple will do in this recipe. I used Gala apples and left them unpeeled for even more apple flavor, but you can peel them for an extra smooth apple butter. I like my apple butter spread onto biscuits or toast, or even used to make apple butter oatmeal muffins. Preheat the oven to 450 degrees. Arrange the apples in your roasting pan and pour over the apple cider. Roast for 45 minutes, or until the apples are very soft. Reduce the oven temperature to 375 degrees. Remove the pan from the oven. Puree the apple mixture in a food processor until smooth and then return it to the roasting pan. Stir in the spices and spread it evenly in the roasting pan. Return the pan to the oven and let it roast for another approximately 1-1/2 hours, stirring every 15 minutes. You want it to be thickened and browned. Let cool slightly and then transfer to your jars/freezer containers to finish cooling. Use within a couple of weeks if left in the refrigerator. Fantastic! Wish I could dig right in! Have a great week ahead, Amy. I love that you included the peels in this apple butter. 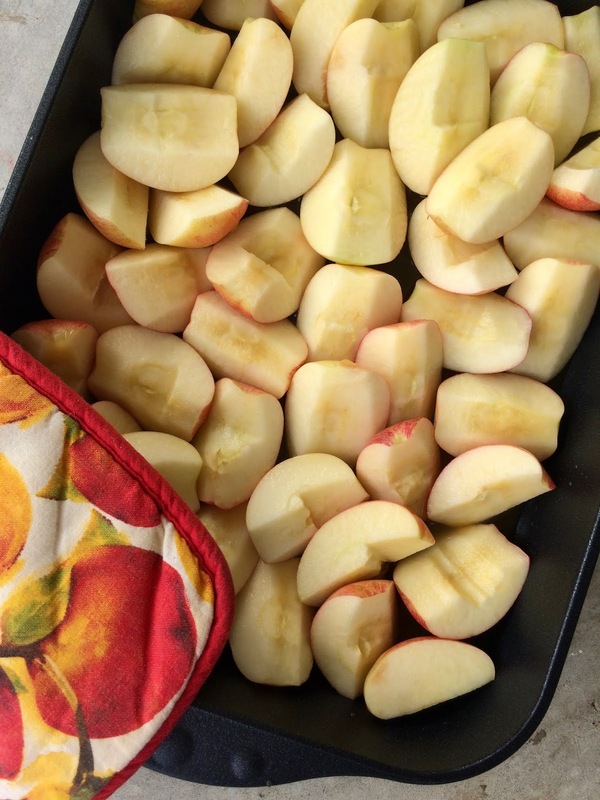 I love the idea of oven roasted apples - that would really bring out the flavour! In Australia we don't really have a food tradition of apple butter but I can see that I would use this in lots of ways. I have never tried doing apple butter in the oven, but I love the idea of it. And I can imagine this smells heavenly as it cooks too! apple butter is one of my favorite condiments of all time! Love that you roasted the apples!!! Yummo, I love apple butter! Thank you for sharing at our apple celebration of Celebrate 365 Blog Party!